Since it's opening earlier this year we've been hearing good things about Brewhouse and Kitchen from friends based to the South of the city. 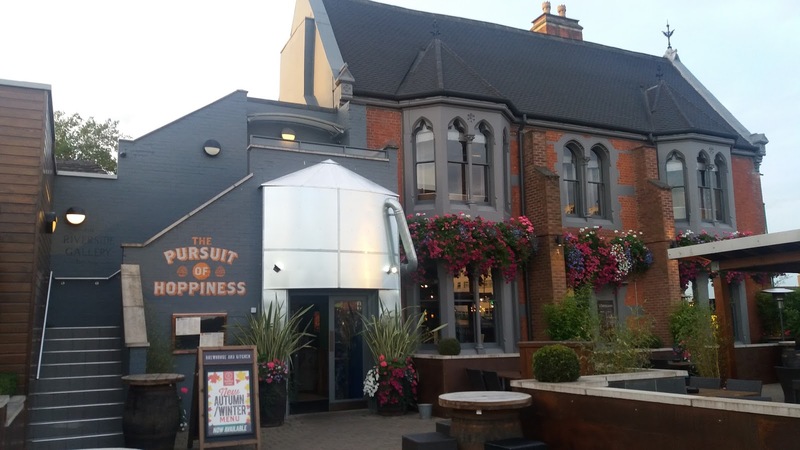 With a great outside seating area for summer nights and being a stones throw from the legendary City Ground and Meadow Lane stadiums means it's in a great location on the edge of thriving West Bridgford and Trent Bridge. We were invited along for a Beer Tasting Masterclass with the Brewhouse and Kitchen (B&K) Nottingham's head brewer. It sounded like a great opportunity we couldn't refuse and although a Thursday night is technically a 'school night' moderation was always going to be practiced. It's a great thing to have a food and drink blog however when you have to be at the day job the following morning it certainly helps us to sample rather than over indulge as we might like to do. As much as the beer we were looking forward to tasting some of B&K's new Autumn menu, lovingly paired with suitable beer options to really address the flavours of each dish. A beer tasting masterclass sounds great, it's on a different level if there's food involved as well. There are a few pubs with their own brewery on site across Nottingham although I'm pretty sure none take their beer production to the levels of Brewhouse and Kitchen Nottingham with eight of their own ales brewed on site as you enter the pub. They're also offering a great Beer Masterclass for £20 that would make a great gift coming into the festive season. To start our evening off we were introduced to Brewhouse & Kitchen's four 'core' beers. All brewed on the premises and will names symbolic of the local area. The Constable- A 3.6% English session ale. A traditional English Bitter named in honour of the venues former life as a Police Station. A light and refreshing bitter made for easy drinking. We'd happily drink it all day (Hence it being a 'session' ale due to a lower alcohol volume). As perfectly suited to a warm evening out on the terrace as it is a couple of pints before kick off across the road. The 1866- A well received single hop ale at 4.4%. Named after the commemoration of the first test match at Trent Bridge between England and Australia. Hoppy and with fruity elements and a nose of grapefruit. The Street Block a 4.6% Red Rye Ale named in honour of local West Bridgford's insistence on not using the term Street whilst naming it's road network. The Street Block was a very nice drink with a malty taste and herby elements. If you're not sure what will work for your own palate it's worth asking whilst up at the bar as they'll be more than happy to let you have a try before you take the step of ordering as there's a whole host more available. As part of the evening it was lined up for us to sample a selection of the new Autumn menu. The menu does away with the traditional approach of a small selection of starters and then a host of mains by steering towards a Tapas style eating through selection of a plethora of different sharing plates. Whilst that might not appeal to the traditionalists amongst us it's a great approach if you're out as a family or group of friends- order a selection and share the food and subsequent conversation among yourselves. The menu is also set up with a recommendation of what beer pairing would work alongside each dish as they believe that beer and food go together impeccably well with elements from certain beers bringing out the flavours of many foods. From our experience it's worth trying. Before our chosen selection of sharing plates arrived out a nice sized platter of fresh and flavoursome Foccacia bread with olives and an Olive oil balsamic dip to tuck into. We've always been big fans of sharing at the dinner table so really liked the idea of Tapas style sharing plates with small dividable portions for a group to savour. Oriental Steamed Buns with Barbecue Pulled Pork and Asian Style Slaw. We've been seeing Bao buns popping up at restaurants and street food type outlets recently so were intrigued on the B&K take on these. The steamed buns look like they should be exceptionally light however have a degree of volume you wouldn't quite expect and the subtle bun works well with barbecue style flavours. Whilst Pulled Pork has become as much a staple of pub food as the humble burger we've seen plenty of places who've been unable to get it right. Fortunately B&K's chef did a great job with succulent pulled pork and a nice punchy sauce. The dish worked really well with the recommended American Style Ale bringing out the full flavour of the sauce and the crunchy Asian Slaw. Lightly Battered Aubergine with Feta and Drizzled Honey sounds a great vegetarian or full on Vegan option. It came out with big, chunky pieces of aubergine win a light, tempura-esque batter. Other diners in our party were so enthused that they were almost on the verge of turning vegetarian although I have to admit it wasn't to my personal taste. I did however, love how it would be great for group sharing. With decent, chunky portions. Best served with a wheat beer. If you like your Nacho's Brewhouse and Kitchen's are pretty addictive. With plenty of flavour and a huge amount of Guacamole on top. Only downside for me was the chips went a little on the soggy side so they're best eaten quickly. The best dish of the sharers we ordered was the Korean Barbecue Breaded Tofu which was absolutely amazing. It had a fantastic texture almost like a soft cheese with four huge sized pieces to share and a punchy sauce drizzled on top. From sharers we went on to sample some very nice Peanut Butter Milk Stout which was almost the beer equivalent of a dessert wine. As someone that loves a nice dark beer such as a Stout who cannot be trusted when left alone with a jar of Peanut Butter it was as close to beer perfection as I've seen recently. With a chocolate fondue top finish we would have been at a ski lodge in the Alps for dessert if it wasn't for the fact that this fondue was made with chocolate and cask ale to add another element to our evenings beer tasting masterclass. We really enjoyed our visit to Brewhouse and Kitchen Nottingham. With a modern pub interior and emphasis on good beer they're also offering good food to really entice people to come inside and try their offerings. It's great to see the Brewery at the heart of the pub. Our one restraint is whether it will be successful in the longer term. It's 4 months since the much renowned Riverbank reopened as Brewhouse and Kitchen. We know plenty of smaller pubs that get fairly busy on a Thursday night however B&K was very quiet. Whilst we'll sing their praises if you can't entice locals out for a pint on a nice October evening it will leave them heavily reliant on weekend and football trade. The combination of very nice food and great beer should hopefully spur the Brewhouse and Kitchen on to success on Trent Bridge however at some point their pricing will need some scrutiny. The competition in West Bridgford is getting tougher all the time.